A disconcerting epidemic of needles found in strawberries is sweeping Australia and lawmakers are considering raising the penalty for saboteurs to 10 years in prison. There have been 10 reports and counting of needles being found in the fruit with more cases being reported to police late Tuesday night. Five of the cases were reported to police from the areas of Bicton, Darlington, Hocking, Morley, and Rossmoyne. One of the cases occurred Tuesday morning in Willetton where a primary school student bit into a strawberry and felt a sharp object. More reports came from York, Kelmscott, Spearwood and Bull Creek prompting WA Police to issue a warning when preparing to eat strawberries. Police also said if people find anything suspicious they should report it to the authorities. 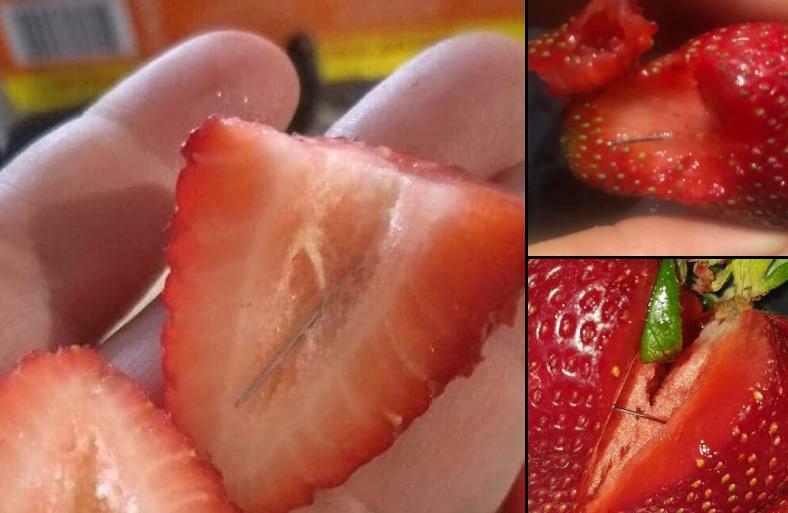 One of the more recent incidents occurred Tuesday when an elderly couple found a needle inside a strawberry. They say that a sewing needle was inside a strawberry they bought from a grocery store at Maddington Central Shopping Centre yesterday. The elderly couple says the fruit came in a Kimmy's branded punnet that was grown on a Gnangara farm. The discovery disgusted the grower My Doan who says there is no way it happened on her farm. She told local news Perth 7, "I feel very angry, and very upset because that's not our fault if we grow a strawberry, how is there a needle inside?" The epidemic of sabotaged fruit even prompted the Queensland Premier Mark McGowan to put a $100,000 bounty on the mysterious strawberry saboteur. Police received a call from an anxious Burrendah Primary School official who said a female student had been injured after biting a needle that was inside a strawberry. One parent said, "It is pretty concerning, I mean that is very close to home." Another father in York found a needle when he was cleaning the fruit Monday and two more cases followed in Kelmscott, and Bull Creek. Another case occurred overnight in Spearwood when a teenager told police he and his sister found a needle in a punnet of strawberries. The string of discoveries led to Nationals MP Barnaby Joyce asking for a substantial increase in the reward being offered for those responsible for the strawberry needle crisis. Joyce called for the criminals responsible to be "pursued and hunted down" and warned anyone withholding information that could lead to the perpetrators is also committing a crime. "The reward… has to be substantially increased to hunt this person down," Joyce said. "It is not only a threat to the strawberry industry, it is a threat across the food production industry. We have got to treat it as such." Joyce's sentiment is echoed among federal officials who are set to introduce a new law which could see saboteurs jailed for up to 10 years in an effort to combat the needle epidemic threatening the nation's strawberry crops. The fear of swallowing a needle has gripped the nation and the fruit industry is suffering as a result. Video emerged on Twitter from Sky News showing thousands upon thousands of strawberries being destroyed. Prime Minister Scott Morrison called those behind the mass contamination of the fruit as "grubs" and "cowards". Morrison also said Parliament would continue sitting until a new law is passed targeting "reckless behavior". The new laws would not only raise the penalty for saboteurs but it would also increase penalties already in place relating to existing adulteration behavior increased to 15 years from 10. Morrison called for a crackdown among all States saying that tougher laws were needed immediately. "Some idiot, for his own reasons, or her own reasons, has engaged in an act of sabotage, it would seem, that has put all of that at risk for these people just out there having a go," Morrison said. "And not only that, mums and dads and their kids have been put in the position of having a real concerns and, indeed, fears. It's not on." Morrison added that he hoped the penalties would help with the current fear of buying fruit plaguing the states. "If Australians can just go back to loving the strawberries and buying strawberries, of course taking the necessary precautions, then I would urge them to do that and be careful how they go about it," he said. "The clear message is this, this is not on. This is just not on this country." If a person dies from this terrorist act…. yes it can be defined as Terrorism…. Then the guilty party should swing. The persons body burned in pig fat and the ashes scattered to the wind .